A couple of weeks ago my 3 year old daughter came home from preschool with a small plastic bag full of dental hygiene products. She was so excited to show me her new toothbrush, toothpaste and floss. Vivian LOVES to brush her teeth. SHE will make sure it happens at least twice a day. So, I can only imagine her excitement when an educator from a dental office came to talk to her class. When I came home from work, my babysitter, Kate, did the “handoff,” and updated me about their afternoon. She let me know that Vivian’s teacher had told her about the classroom visit from the dentist office and that they learned about “healthy” and “unhealthy’ foods. She told me with a bit of a grimace on her face, because she knew how I would feel about that. Furthermore, age inappropriate nutrition education causes our children harm. When we tell children certain foods are good or bad, healthy or unhealthy, red light or green light, “go” or “whoa” foods, we are trying to teach them an abstract concept in a concrete way. You and I can understand that a food high in sugar may increase one’s risk for tooth decay (depending on several factors), and we can also understand it’s ok to eat foods sometimes with sugar in them. They are not foods to fear. However, its an abstract concept to understand the complexities of this. A 3 year old doesn’t have the ability to understand abstract concepts and nutrition is very abstract. Young children may hear this lesson and become fearful of the foods that the educator deemed as “unhealthy.” Sensitive children may stop eating adequately because of this fear around food. Sometimes, I think that our method of nutrition education is to scare the child so much, that they say something to their parent. We think we can get the message to the parent through instilling fear in the child. Vivian’s bag from the dental educator did include a handout about nutrition. It is appropriate to provide this health education directly to the parent. The parent could then assess how or if they are going to implement this information in their family feeding. After I heard this frustrating news and had a “Mommy Bear” reaction of wanting to shield her from fear based nutrition education, I reached out to my colleagues who understand the complexities of age appropriate nutrition information. I was reaching out for support and for people to commiserate with me. However, our discussion was much more than that. It was fascinating to discuss the topic of food, shame and dental care and the parallels with weight based medical treatment became clear us. My two older children have two different experiences when they go to the dentist. My oldest child brushes her teeth religiously, much more than my middle child. She has had several cavities and always gets many questions from her dentist about what she eats. Does she eat sugary cereal? Gummies? Lots of candy? My middle child gets served the exact same food as my oldest child, brushes less and has never had a cavity. He typically doesn’t get questioned about his food intake. It’s clear to me, and from what I understand, people’s teeth and mouth environment can be more or less susceptible to plaque and, thus, cavity development. Factors that affect this susceptibility are largely out of their control. 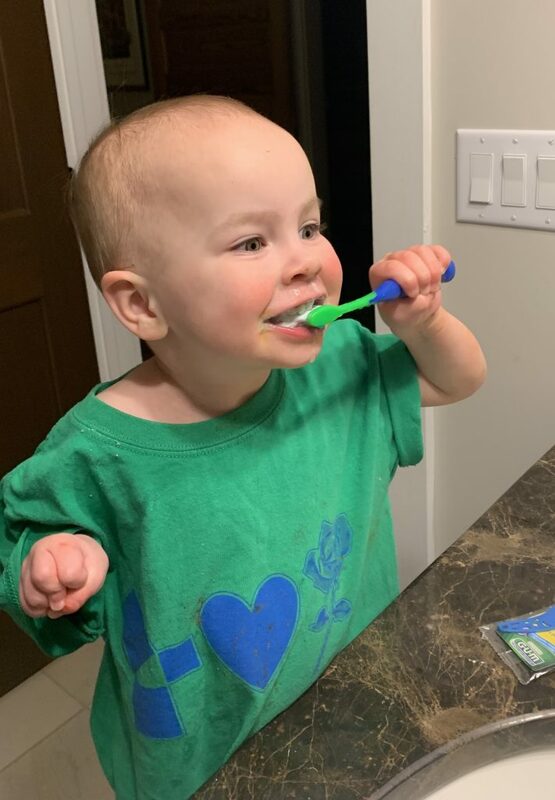 Several of the dietitians that I contacted about my frustration with the preschool dental education began to share their own experiences with going to the dentist. A couple of these dietitians shared that no matter how much they brushed and flossed, they would go to the dentist as a child and young adult and feel shame that they didn’t clean their teeth well enough. They would dread going to the dentist. The dentist would ask them a million questions about how much they were brushing and flossing and what they were eating, because of the amount of plaque and cavities they had. It wasn’t until they were adults and/or changed dentists that they understood that the cavities weren’t their fault. Some people are more susceptible to cavities. No amount of brushing or flossing will totally prevent cavities in some people. They were shamed because of factors that were outside of their control — genetics, oral environment, water supply, and deep grooves in their teeth. The parallel between how they felt going to the dentist and how children (and adults!) in large bodies often feel going to the doctor, became clear to us. Children in large bodies go to the doctor’s office and, because of their weight, are often drilled about what they eat. They may be instructed to make certain changes to their eating and if their weight doesn’t change, they may feel shame about going back to the doctor. Children in large bodies often dread going to the doctor. Children in smaller bodies are much less likely to experience this. The truth is, body size in mostly determined by genetics, just as someone’s oral environment and susceptibility to cavities is. Research shows us that kids in larger bodies do not eat more than children in smaller bodies. Yes – you read that right. Children at the upper end of the growth charts as a whole do not eat more than children on the lower end of the growth curves. As a medical field, our “solution” for kids who have larger bodies is to tell them to eat less but they are typically not eating differently than their thinner peers. Genetics and someone’s zip code, factors outside of children’s control, are much more predictive of body size than anything else. 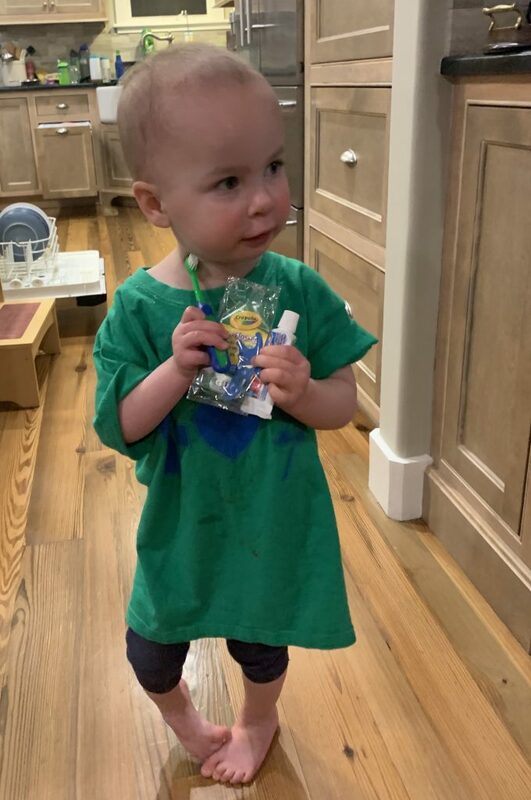 Just like my son doesn’t eat differently than my older daughter and he doesn’t get cavities, some children have larger bodies and their genetics, not diet, determine that. A focus on weight and restricting one’s intake by the doctor, sets up children in larger bodies for shame, dieting, weight cycling and avoiding the doctor, all things that lead to health problems. What if instead, as medical providers, dentists, dietitians, doctors, and nurses, we approached our work from an evidence-based philosophy, including giving age appropriate education to children and adult appropriate education to parents? What if we stopped shaming children for factors that they have no control of? What if we focused on behaviors that enhance health, not weight loss or fear based messages that cause health problems? What if we reduced the dread that many people feel coming to see us? We can do better. It snowed here yesterday! YAY! Snow days are some of my favorite days! I love snow for its beauty and the slowed pace it brings our life. Here in the DC Metro area snow often means school is closed. What a gift to have an unexpected day to spend time together. Another reason I love snow days is they’re a great opportunity to bake and/or cook something I might not make regularly. There’s something so comforting about being in the kitchen on a snowy day. Rain and ice were predicted for the afternoon yesterday so I decided we’d make homemade soft pretzels. The recipe is simple to make. And kids love the soft, smooth feel of the dough. 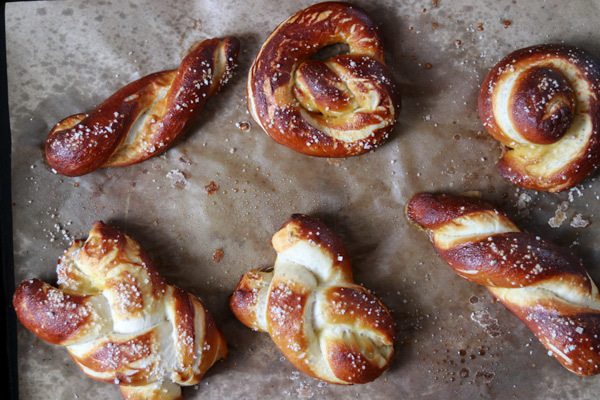 It’s fun to make some unconventional pretzel shapes! 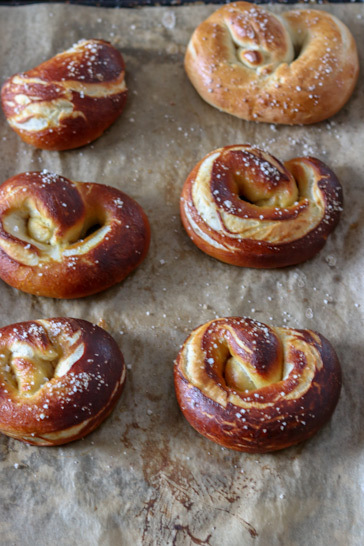 I’ve always used Alton Brown’s Homemade Soft Pretzel recipe. I’ve rewritten the instructions in my own words, but the ingredients and measurements are unchanged from his recipe. 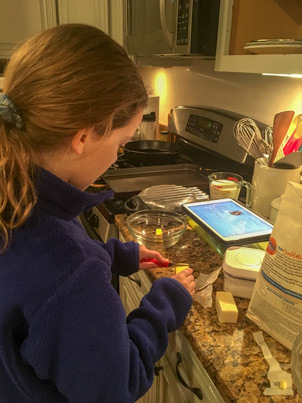 As I mentioned in my previous post about cooking with kids (you can read it here), cooking with them doesn’t have to be complicated. Here are some simple ways even young children can help make these. You could invite them in at any one of the steps in the process. (Kids shouldn’t help with the step that involves boiling the pretzels). As you can see, it looks like one pretzel didn’t get the egg wash (this is what helps then brown). But no big deal! It still tasted great! Cooking together creates opportunities for connection, creativity and curiosity. 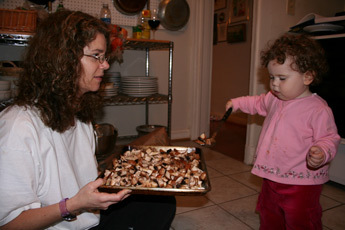 Cooking provides a great opportunity to teach a little reading, math, science, history and where our food comes from. It also offers children a chance to experience new foods. Kids are more likely to try a new food if they’re involved in the preparation. I’ve made this recipe for years and when the girls were in preschool I made these at their school with each of their classes. 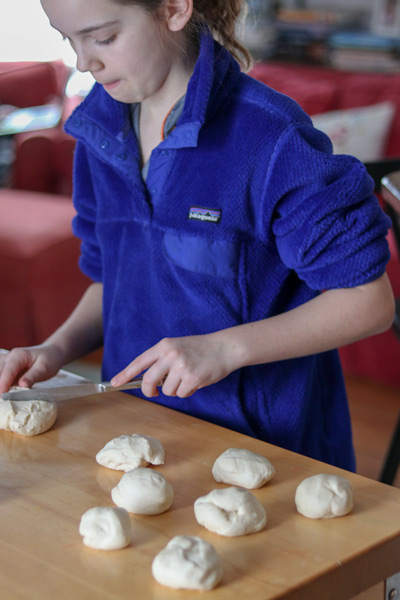 Any recipe that uses yeast provides a great opportunity for a quick science lesson. I hope you had a Happy Valentine’s Day! Each year I usually bake cookies with the girls. Click here for the recipe for the Valentine’s cookies we made last year. Today, Ellie and I made sugar cookies! 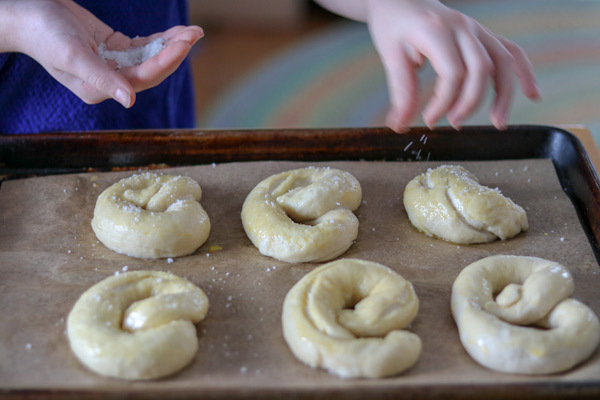 Baking is just one simple way to involve kids in cooking. You can measure out all of the ingredients ahead of time and have your child help cut out the cookies or sprinkle on the sugar to keep things simple. 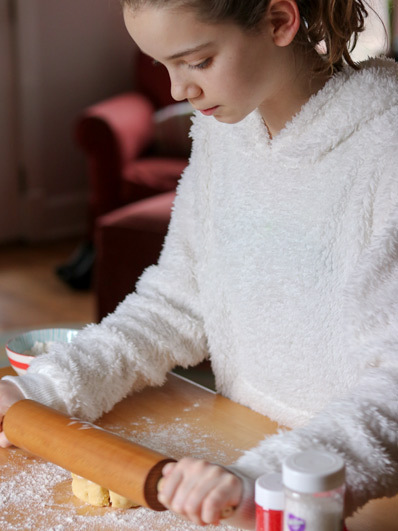 The thought of cooking with kids, especially young ones can feel overwhelming. But it doesn’t have to be complicated. You can let them just stir something, or sit on the floor with an empty pot and spoon and “cook” on their own or simply unwrap a stick of butter. As they get older and begin cooking on their own, things can get pretty messy! This is a great opportunity for them to take on the cleanup process, too. It’s a bit hard to see, but note all the flour on the floor and the Learning Tower. We got so much use out of ours. Safety in the kitchen is often a big concern for parents. 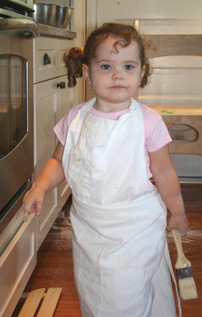 Think about age appropriate kitchen activities. Use the back burners on your stove and keep knives and other sharp utensils out of reach of young children. You’ll want to give children activities that are safe and age appropriate. For instance, your toddler/preschooler isn’t going to cook anything on the stove or use a sharp knife. Letting children help in the kitchen provides a nice opportunity to teach them about kitchen safety, following rules and even math. They’ll need lots of supervision and something safe to stand on or in (we used this Learning Tower when Caroline and Ellie were youngl). 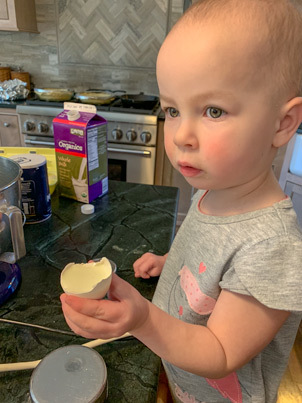 Anna’s daughter helped crack the eggs. Let them cut soft foods like strawberries or butter with a butter knife or one of these knives designed for young children (Put a damp towel under the cutting board so it doesn’t shift around). 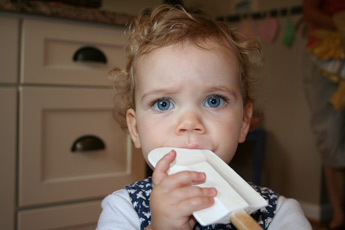 This is Ellie about 9 years ago concentrating hard on licking the spatula! Once kids reach this age group and they have all those years of cooking with you, they’ll really take off. Teach them to safely use a sharp knife. At this stage they can help with making meals on a regular basis, even. They still need reminders of kitchen safety (tweens especially). And there might still be a big mess when they’re done. One of my earliest and fondest memories was in preschool when we cooked lunch for our parents. We made tomato soup and grilled cheese (or maybe it was open face toasted cheese sandwiches.) I have a memory of standing on a chair so I could have my turn at stirring the soup. I’m sure that’s where my love of cooking began! 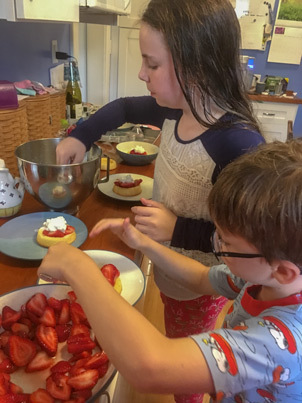 If you’d like to read more about the benefits of cooking with kids click here to read a previous post. 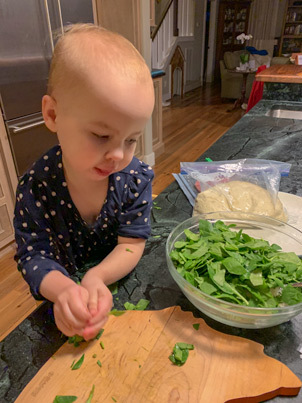 What are your favorite ways to cook with kids? And how do you celebrate Valentine’s Day? We love to hear from our readers! This recipe is adapted from Maida Heatter’s Cookies. Bake these yummy cookies up either crispy or soft. Gently whisk the flour, baking powder and salt together and set aside. Cut the softened butter into about tablespoon size pieces. Place them in the bowl of an electric mixer and cream using the paddle attachment. Then add the sugar and vanilla extract and beat for a minute or two. Add the eggs one at a time beating after each addition. Then add the milk and beat until combined (just a few seconds). Scrape down the sides of the bowl. Gradually add the dry ingredients and mix until combined. 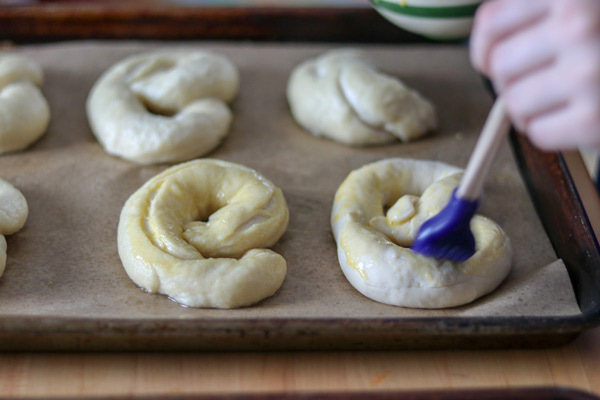 Remove the dough from the mixer bowl and divide the dough in two. Wrap each half in parchment paper or wax paper. Chill for 1-2 hours. Preheat your over to 400 F.
Roll out the dough on a floured surface using a lightly floured rolling pin. Roll the dough to about 1/4 inch thickness. Use whatever shape cookie cutter you’d like. Place the cutouts on a parchment-lined baking sheet. Sprinkle generously with sugar. Bake for 5-10 minutes depending on the size and thickness of your cookies. Sometimes we make these thick and bake them on the short side so they stay soft. Then we frost them. And sometimes we roll them thinner, sprinkle them with colored sugar and bake them a little longer for a nice crisp sugar cookie. 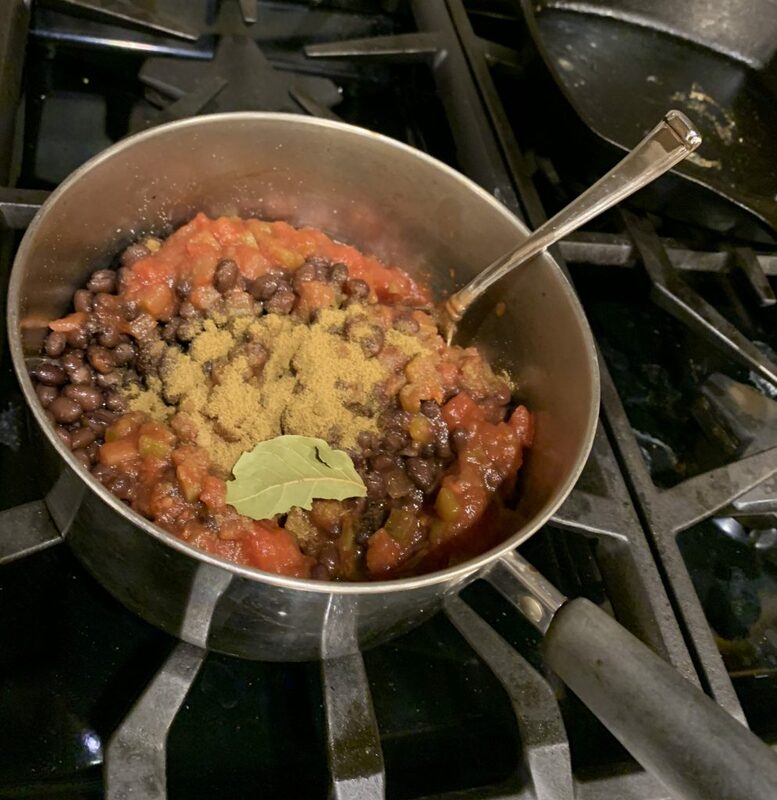 A couple of weeks ago, I wrote a post about “go-to meals.” I define “go-to meals” as meals that we typically have the ingredients for in our pantry and meals I can make without planning and make quickly. I imagine you know the scenario: It’s dinnertime. Dinner hasn’t been started and you either don’t have a plan, the plan would take too long to get on the table, or you planned an easy meal because you knew it would be a hectic evening. 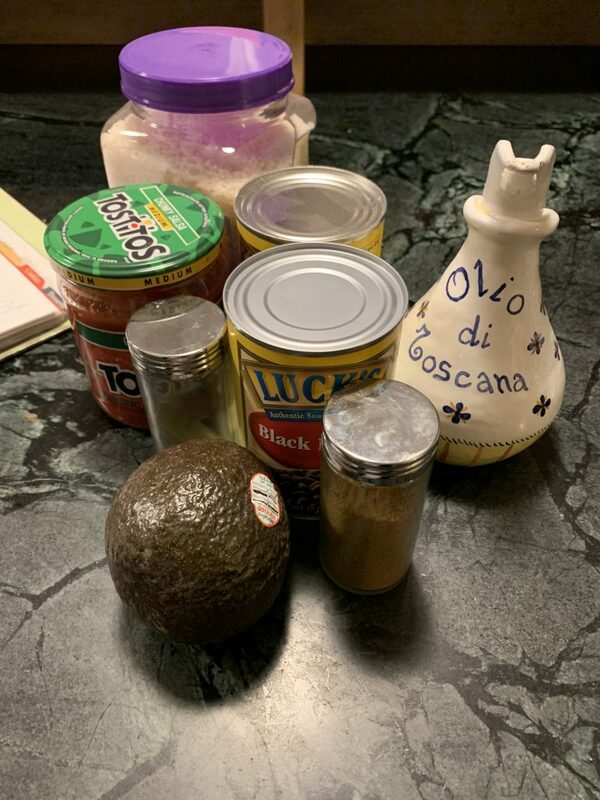 Last week, Elizabeth wrote a follow up post, “Go-To Meals – Part 2,” with her family’s “go to meals.” We got a kick out of each of our lists, because many on her list would probably be on my “standard meals” list. They are not “go to meals” for me, because I would think they would take too much effort for me to make. This highlights how we all have different skill levels and comfort in the kitchen and, thus, some meals seem harder for some than others. If you haven’t figured it out yet, cooking and planning meals takes a bit more effort for me. I very much value it, but it’s something I have to be constantly working on. Elizabeth is an amazing cook and makes cooking look easy. She actually taught me how to chop vegetables when we were in graduate school. Her ability to be calm in the kitchen has helped me learn simple skills to make cooking a little easier for me. For example, I am no longer intimidated to make a really yummy salad. Putting together a salad has become a “go to side” for me. When, before, I would have felt like it was “too hard” or that it wouldn’t be very good. Having more experiences in the kitchen and having simple skills can make cooking feel a bit easier and can expand your list of “go-to meals.” However, the fact is, we all have our own strengths and what may be a “go to meal” for you may not be for me, and vice versa. 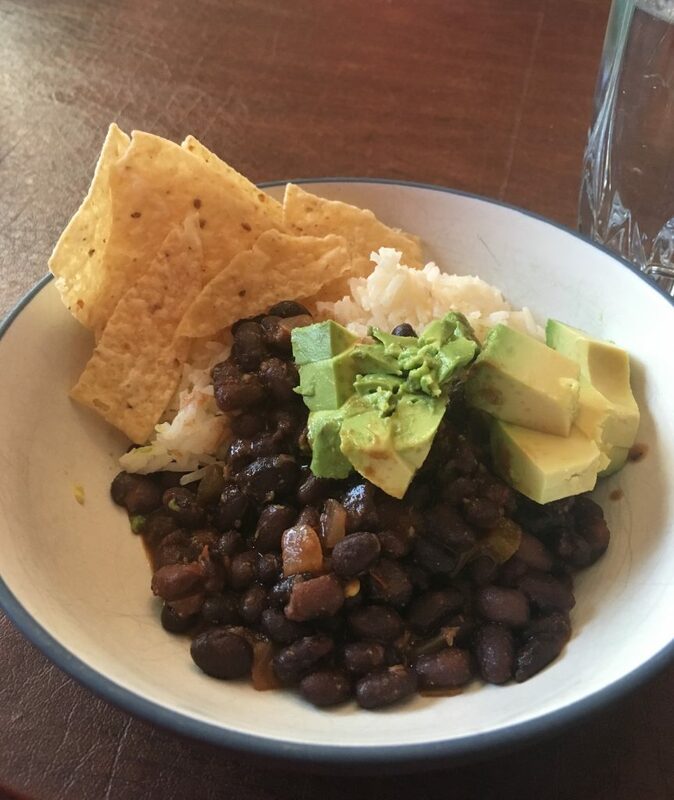 After my post about “go-to meals,” a reader asked me for my Black Beans and Rice recipe. This is a super easy recipe (for me) and something we have been making for years. This is a recipe I share often with my clients. First, open 2 cans of black beans and pour them in a colander in the sink and rinse. I let them sit there awhile. Then, put 4 tablespoons of olive oil in a medium sized pot. At this point I don’t actually measure any of the items. 4 tablespoons is about four circles around the pot. Add 4 garlic cloves, minced and sauté for 1 minute. I usually use a garlic press such as this one. However, when I made this last week, I didn’t have any garlic and made it without it! Add the beans, 2 bay leaves, 1 cup of salsa, and 2 teaspoons of cumin. Stir and simmer for about 10 minutes. Serve over rice. 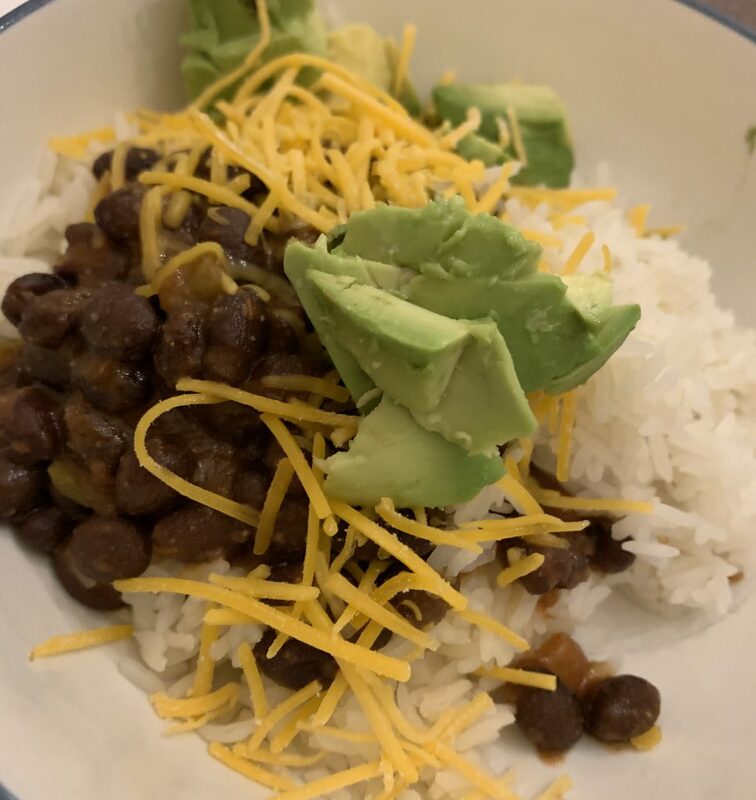 We like to serve with shredded cheddar cheese and diced avocado and each person can top their bowl as they’d like. 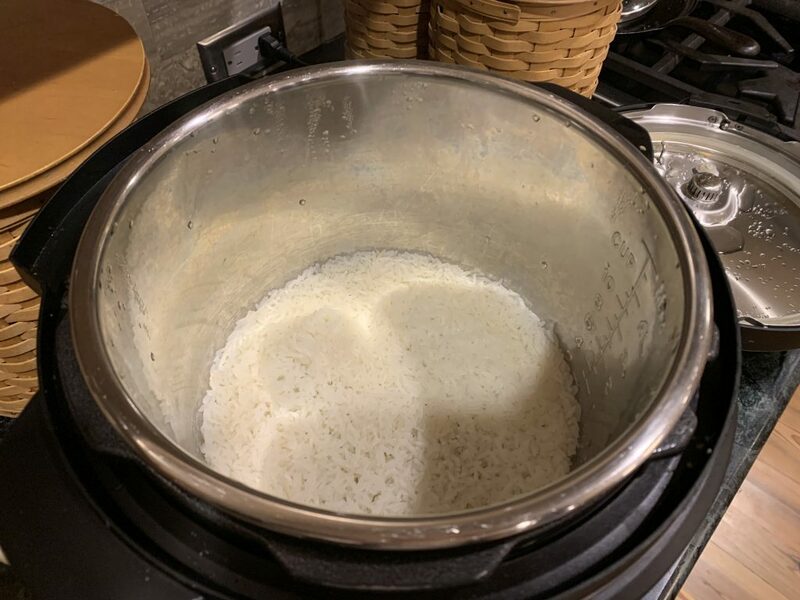 I’ve been recently making rice in my Instant Pot. It feels like one less pot to attend to during the busy dinnertime. I put the rice and water in the pot and then just set it. The beans can also be very good with tortilla chips or inside a tortilla, as a burrito. This is not authentic black beans and rice. But quick and very easy! This post includes an Amazon affiliate link. 1. Heat oil in a medium sized sauce pan. 4. Stir and simmer fo 10 minutes.